This interview will be part of Manfred Gerstenfeld"s forthcoming book, American Jewry's Challenge: Conversations Confronting the 21st Century. This is part of the project Jews in the American Public Square, initiated by the Pew Charitable Trusts. A Hebrew version of this article may be seen at Makor Rishon. Years before September 11, 2001, Pipes uttered warnings that militant Islam was a violent threat to American security. In 1998, he wrote in the European edition of the Wall Street Journal that militant Muslims were at war with America, not because of what America did, but because Islamists perceive themselves as being in a long-term conflict with the values of the West. 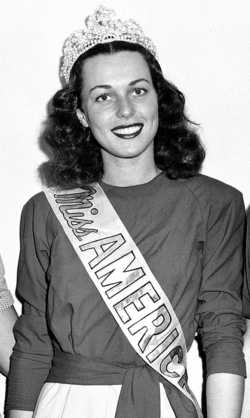 Bess Myerson crowned as Miss America in 1945 was a step toward the Golden Era of American Jewry. Pipes contends that the mega-events of the last few years may have ushered in a less favorable era for American Jewry: "The Jews' Golden Age in America began in 1950, when social restrictions were eased in universities, banks, businesses, clubs, etc. This period may now be ending with the growth of the American Muslim population. Within that community, there are significant elements that see American Jewry as their prime enemy; they perceive Jews as the cause of Islamic failure. To counteract this, the Jewish community has to develop a greater understanding of how Muslims think; in particular their more radical elements, those supporters of militant Islam known as Islamists. 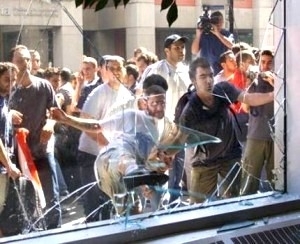 "Several American Muslims have resorted to violence specifically against Jews. One example is the 1994 attack by a Lebanese taxi driver who - after the Baruch Goldstein massacre in Israel - went out looking for Jews to kill. He ended up shooting a van full of Hasidic boys on the Brooklyn Bridge, killing one of them." The problem of Muslim hostility is not limited to the United States. Already in 1992, Pipes wrote that for world Jewry "Muslim anti-Semitism is an increasing problem, and to a large extent this is linked to the ever-growing population of Muslims in the West." He now adds: "The European Union's unwillingness to confront the pattern of anti-Jewish hostility emerging from Muslim religious, media, and educational institutions is decades old. All indicators suggest it is unlikely Europeans will have the courage to confront this problem adequately. One may expect a major Jewish exodus from Europe, perhaps like that from Muslim countries fifty years ago." Pipes explains in more detail what Jews and others have to understand about developments in the American Muslim community. "Many American Muslims differ from other immigrant groups the U.S. has received. American society may not be able to co-opt large parts of this group. Moderate Islam is not standing up to the extremists in most places of the world. As a result the United States has to confront them." Pipes stresses that Muslims in the United States have done very well. Presenting them as an oppressed group is a fallacy promoted by various Muslim groups. He says that these false perceptions led President Bill Clinton to state in early 2000 that American Muslims are subject to "discrimination" and "intolerance." In the same year, the Senate passed a resolution condemning "discrimination and harassment of Muslims." In that article, Pipes listed many business tycoons of note in the Muslim-American community. He added: "Muslim Americans proudly say that theirs is 'the richest Muslim society on earth,' and they are right." Pipes also mentioned that the media generally treats Islam and Muslims positively, and that mosques are often welcomed in communities where non-Muslims sometimes donate funds for their construction. He stresses how - despite the fact that the Islamic prayers are not easily compatible with American work habits - many factories try to accommodate them. Pipes mentions that in a poll in 2000, 66 percent of U.S. Muslims agreed with the assertion that "U.S. society currently shows a respect toward the Muslim faith." Pipes wrote that "the Muslim effort to be accepted in the United States is not a particularly difficult one, for enlightened Americans make persistent efforts to understand Islam and portray Muslims positively. This results from a sense of guilt about past prejudice, plus a multiculturalist impulse. Jewish and Christian groups often join with Muslim counterparts to fight what they perceive as bias." He adds that non-Muslim lawyers frequently provide Muslim defendants with pro bono services and non-Muslim institutions make funding available. In this context, it is important to understand the motivations and world of thought of extremist Muslims. Pipes defines an Islamist as one who believes Islam is the solution to every problem. "In America, an Islamist would be somebody who wants to replace the constitution with the Qur'an.2 It is a totalitarian movement that has much in common with fascism and Marxism-Leninism." He estimates that about 10-15 percent of Muslims in the world are Islamists, which is tantamount to well over a hundred million people. Pipes adds that the percentage is probably in the same order of magnitude among U.S. Muslims. He forecasts: "There will be more attacks by Islamists on Americans. I can say this confidently because so many signs point in this direction. These assaults will awaken people. I expect it to be a one-way process of what I call education by murder. I do expect ever more Americans to worry; contrarily, I do not expect to hear many say, 'Well, I used to be worried about the threat of militant Islam, but no longer.' As time passes and more events occur, their assessment will become more realistic. "As Islamists are dangerous, the methods to be used against them cannot be like those the United States usually applies to dissenters. However, much of the U.S. public is unprepared to discuss these matters; if one broaches the topic, one is accused of McCarthyism. "One little-noticed development concerns the declaration of war. This used to be part of a military undertaking, but since World War II it has become defunct, and along with it the legal machinery that once went into gear. When President Bush says we are at war, it is a political statement, not a legal one." Pipes adds: "There is a gradual awareness developing of militant Islam existing not just in the hills of Afghanistan but within American society. This is unparalleled in our country's history, as the United States never seriously confronted fascism or communism internally, as Europe was forced to do. Americans certainly never experienced a hazard from an ideological source comparable to the Islamists. "The focus on al-Qaeda is doubly misplaced. First, it is an umbrella group, rather than an actual organization. Second, it is a symptom of a much deeper attitude. The ideology is the key, not an organization. This ideology is a force in itself and not the result of socioeconomic conditions; it cannot be solved, for example, through a Marshall Plan type of response. "Militant Islam cannot be compared to any segment of Christianity, Judaism, or Hinduism. These religions do not embody groups with totalitarian utopian ideologies that seek world hegemony. In fact, militant Islam resembles fascism and communism more than any religious movement. "All we can do presently is prepare ourselves for worse to come. Eloquence and perceptivity did not make Churchill prime minister of Great Britain; it was the fall of France* that did so. In like fashion, those who are warning of the dangers of militant Islam will be turned to should a fall-of-France style disaster occur. "Conservatives have increasingly become the backbone of understanding what the United States represents, what its duties are, and what it means to be an American. While Jews have traditionally been on the liberal side of the political spectrum, many are now becoming more conservative. Nevertheless, as moderate Democrats move increasingly to the left - as Dennis Prager points out, it is hard at this point to see a difference between a liberal and a leftist - there are many Jews on the left who are part of the problem. They see the United States as a 'rogue state,' want it never to respond with force, call for open borders, and generally disparage their own country." Protesters rioted to prevent Benjamin Netanyahu from speaking at Concordia University in Montreal. Pipes sees developments at universities as particularly worrisome: "The academy is attempting to close down debate of key issues, making it less open to free exchange than the media, the government, think tanks, and even corporations." He has written that academics work more insidiously than the street toughs they effectively team up with on occasion. Pipes defined this as follows: "They maintain a veneer of civility. Sometimes however, they reveal their true face of intolerance. A typical example of this was when a mini-intifada3 prevented former Israeli Prime Minister Binyamin Netanyahu from speaking at Montreal's Concordia University." Pipes had somewhat similar experiences in Canada. In January 2003, the Middle East Students Association at Toronto's York University temporarily succeeded in canceling a lecture of his on "Barriers to Peace in the Middle East." The university's president, however, decided Pipes could present his views, but his lecture had to be given in a curtained-off part of the basketball court, while large parts of the campus were blocked off. Before the lecture, a Canadian policeman felt the need to warn Pipes that certain public statements, such as promoting genocide, could be punishable by several years in prison. Only students were admitted to the talk, and they had to collect their tickets one day before. In an article in the Canadian daily National Post, Pipes wrote: "The attempt to close down my talk also confirmed the specific sources of hostility to free speech...they invariably and uniquely come from the extreme left, Islamists, and anti-Israeli activists. "4 He added: "My visit to York confirms, as if one needed more proof, that the North American university has become...'an island of repression in a sea of freedom.' This problem was inadvertently but succinctly captured by a newspaper headline: 'York University to Allow Talk by Pro-Israel Academic.'" Pipes had a similar experience in early 2004 at the University of California at Berkeley. He was invited by the Israel Action Committee and Berkeley Hillel to speak there. Tens of radical Muslim students tried to prevent him from speaking and chanted "racist" and "Zionist." Pipes was forced to stop many times, and even addressed the protesters a number of times, pointing out their undemocratic behavior as well as the fact that heavy security is required only when he is invited to college campuses. He explains: "Universities have been on the left in many countries for a long time, in Japan for instance. Many students have their wild years there and thereafter become more grounded. It is noteworthy how little the university ideas influence society. In the United States, however, the leftist ideas emanating from the universities are permeating society. One notable arena would be the court system, where they are transforming such varied concepts as the right to privacy and the meaning of a contract. "Many academics tell the public that the problems with the Muslim militants have nothing to do with Islam as such. This makes it more difficult to confront radical Islam. Campus Watch - which the Middle East Forum founded in 2002 - exposes academics who blame ourselves for terrorism, apologize for militant Islam, and call for the destruction of Israel. Campus Watch calls attention to what the Middle Eastern Studies specialists are saying and writing." Against this background, Pipes in particular expresses regrets "that there are few voices of moderate Islam. They are often intimidated, not well organized, and in retreat." He believes militant Islam has to be destroyed and marginalized like fascism and communism were, and sees this as a process that may take several decades. Part of this effort, he says, is assisting those who want to construct a moderate, anti-Islamist version of Islam. "There are many historical precedents of indigenous moderates being unable to stand up against totalitarian extremists. The moderate Germans were nearly useless in the fight against Nazism. All they could do was inherit what the allies had accomplished by conquering Germany and obliterating the Nazi regime. The same has happened in Afghanistan. The Northern Alliance could only take over once the Americans had chased out the Taliban. "Positive developments may also occur in the Islamic world. Iran, for instance, could radically change its policies and bring in a moderate regime. It has not economically developed while suffering militant Islam for twenty-five years. It is not so absurd to think that at some point in the future Iran may become more of an American ally than France. "The Europeans, with their low birth rates, have brought in immigrants from Islamic countries. Indicators suggest that Europe is gradually becoming part of the Muslim world: certain parts of France are no-go areas for the police; instances of the severing of limbs turn up in Italy; Germany enforces aspects of Islamic law; and 'honor' killings of women recur in Scandinavia." Pipes thinks it likely that Christianity and Islam are on a collision course as they compete for converts and power. "Islam is on the offensive when it preaches jihad.5 It means enlarging the territories ruled by Muslims at the expense of those ruled by non-Muslims. This territorial expansion has always been central to Islam. "Contemporary jihad is the main source of terrorism and has inspired a worldwide campaign of violence. Jihadist groups murdered Egypt's president Anwar al-Sadat in 1981, slaughtered more than ten thousand Christians in Indonesia and perhaps two million Christians and animists in Sudan, and have been a leading cause of violence in Kashmir and Israel." Despite this confrontation, Pipes does not see Islam as having all the momentum. "In the world at large, Christianity is growing at least as rapidly as Islam. It is no longer largely a European and North American religion. The main centers of Christian vigor are now in Africa, Latin America, and Asia." When speaking about future developments, he says: "Unfortunately, the U.S. will have to shoulder more, similar burdens in other parts of the world, as it did in Afghanistan and Iraq, because nobody else wants to get involved. It would be disastrous if we followed Europe's self-hating weakness. The United States thus has no choice but to lead the democracies away from appeasement policies. This means that the major antagonism against the U.S. - which already inevitably exists - may become even stronger." He concludes by cautioning: "When one says these things, one always has to be sure that one is not too far out in front. I had articles in my computer before 9/11, such as the one which came out only afterwards under the title 'The Danger Within: Militant Islam in America. '6 In it, I said that most of the organized American Muslim community was in the hands of extremists, and it agreed with the Islamist goal of turning the United States into an Islamic state. "I quoted a moderate, Muhammad Hisham Kabbani, of the relatively small Islamic Supreme Council of America. In Kabbani's reliable estimation, such 'extremists' have 'taken over 80 percent of the mosques' in the United States. It is not just the mosques: schools, youth groups, community centers, political organizations, professional associations, and commercial enterprises also tend to share a militant Islamic outlook that is hostile to the prevailing order in the United States and advocates its replacement with an Islamic one. Had this article come out before 9/11, it would have been dismissed as eccentric." In this article that Pipes did not want to publish earlier, he wrote: "The Muslim population in this country is not like any other group, for it includes within it a substantial body of people - many times more numerous than the agents of Osama bin Laden - who share with the suicide hijackers a hatred of the United States and the desire, ultimately, to transform it into a nation living under the strictures of militant Islam. Although not responsible for the atrocities in September, they harbor designs for this country that warrant urgent and serious attention." * Correction: Norway, not France. Daniel Pipes is director of the Middle East Forum, a member of the presidentially appointed board of the U.S. Institute of Peace, and a prize-winning columnist for the New York Sun and the Jerusalem Post. He received his B.A. (1971) and Ph.D. (1978) from Harvard University, both in history. Pipes spent six years studying abroad, including three years in Egypt. He has taught at the University of Chicago, Harvard University, and the U.S. Naval War College, and has served in various capacities at the Departments of State and Defense. .
1. Daniel Pipes, "Are Muslim Americans Victimized?" Commentary (November 2000). 2. Koran. The sacred text of Islam, considered by Muslims to contain the revelations of God to Muhammad. 4. Daniel Pipes, "The Rot in Our Universities," National Post, 30 January 2003. 6. Daniel Pipes, "The Danger Within: Militant Islam in America," Commentary (November 2001). June 9, 2007 update: Anthony Julius, the eminent British lawyer, used words similar to mine: "I sometimes think that Jews born in the 1940s and 1950s have been living through a golden period but that the closed season on Jews has now come to an end." Apr. 11, 2019 update: Adam Garfinkle answers in the affirmative the question he poses in the title of his article, "The Collapse: Is this the end of American Jewry's golden age?" and he does so without a single reference to Muslims, Islamists, Islam, or Islamism.